Charriol watches at Moscow Watch Expo-2012. Known company Charriol in 2013, will celebrate its 30th anniversary. 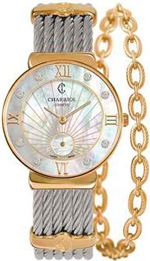 Known company Charriol in 2013, will celebrate its 30th anniversary. This is one of the most popular brands, products which can be purchased in 3,000 stores, 99 boutiques in Europe, America and Asia. Note that the popular brand brought the first collection – Celtic Collection, which was introduced in 1983. One of the characteristics of the line is a special weave bracelet, which was called “Celtic” from thin steel strands resembling rope. The words of the founder of the Philip Shariolya first bracelet this idea came to him in St. Tropez, where he saw a boat anchor line. In 2012, the company has developed a new collection of Charriol Saint-Tropez, which was presented at the World Exhibition of watches and jewelry BaselWorld 2012. After the exhibition in Basel Charriol brand presented its superior clock to Moscow Watch Expo-2012. Among the novelties of many of the original models for both men and women. New items are from different collections: Actor, Alexandre, Colvmbvs, Rotonde by Charriol and Parisii. In each of them play on the iconic pattern Charriol.